Hi, all! Please find below a regular development status report, this one covering the period from Apr 1 to Apr 14, 2019. 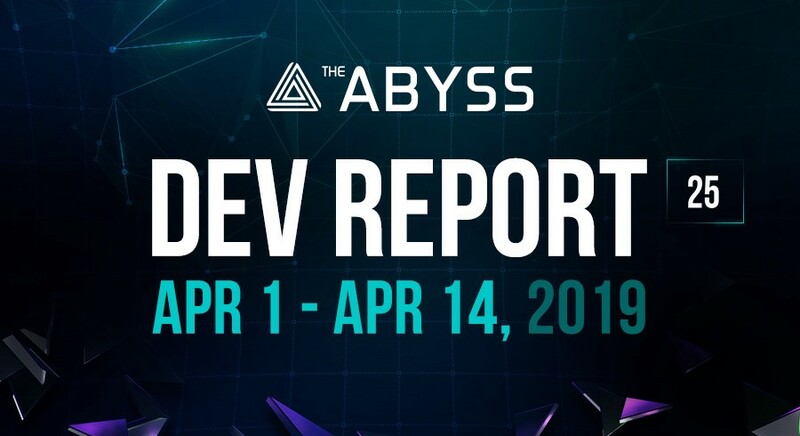 Within this timeframe, we were strongly focused on getting The Abyss Desktop app ready for release on Apr 18, introducing a series of improvements to the existing browser version of the platform and further infrastructure evolution. The finalization of desktop app development that kept us busy in the recent sprint, generally included the integration of games and running a series of tests to make sure all components work fine together and there are no performance problems. More specifically, we’ve test launched the app on various Windows OS versions — both the latest and older ones. We managed to find a reasonable balance between the size of the app and the per cent of OS that support a smooth launch with no additional downloads required. The size of the app will be about 80 MB and it will work well on all Windows OS currently supported by Microsoft Corporation. The new desktop app is a mix of cool technologies, and a One-Click Silent Installation is just one of them. This stunning technology is not widely used yet, however, we decided to implement the innovation to our desktop app. It will take users just a few seconds to install the app on their PCs. The next big thing you will definitely enjoy is a Real-Time Web Interface technology, which means that the client app always contains the latest available info. If something changes in the browser version, the same changes are immediately introduced to the client. In other words, the client is always up-to-date. OK, no more spoilers. On April 18, we will reveal all other implemented features. The only thing to add here today is that compared to the previous version of the client app (released in mid-2018), the new app works faster at the same time consuming minimum tech resources. Watch out for the dedicated Desktop app report on Thursday. The browser version has also been well improved. We have completed the development and started testing and stabilizing the technology that allows to effectively cache the localized web pages. Furthermore, we made improvements to the video/photo gallery in each game. The withdrawal functionality is almost ready for release. It is currently undergoing testing/stabilization. WishList front-end development is complete. We’re now synchronizing it with “My game” page libraries. The basic version of Sandbox has been provided to game developers. Sandbox is a dedicated app for testers and developers delivering a set of tools that allow to test and further develop games and in-game functionality before they go live on the platform. In terms of infrastructure evolution, we have completed compiling a list of requirements to the stage environment (that will help to minimize system risks) and started implementing them into practice. This work will be completed in early May. The inner Reporting system has been fine-tuned, now providing a clearer understanding of user conversion, of how the platform is used, what problems do users encounter, etc. Having all this data on hands, we can carry out a more detailed analysis and introduce the required improvements. Finally, we’ve spent much time on monitoring and analyzing The Abyss environment in Kubernetes framework. All Kubernetes services were correlated to the platform services which made easy to analyze the impact on platform performance. The data transition between Kubernetes infrastructure and the platform works fine, and we can quickly detect the performance problems and respond to any incidents. Well, that’s it for today. The Abyss team is working hard to deliver a desktop client and games integration. And we will keep you up to date with the development process twice per month, as previously. The next report is scheduled for April 29, 2019.